Colour of the paint on the vanity, please? - Hello please can you tell me the brand and colour of the paint used on the vanity? 4. How do I add colour to my bathroom?Don’t shy away from colour in the bathroom. If you choose it well, it won’t date and will create a stunning mood within the space.Adding colour is about creating a restful space that complements your design. 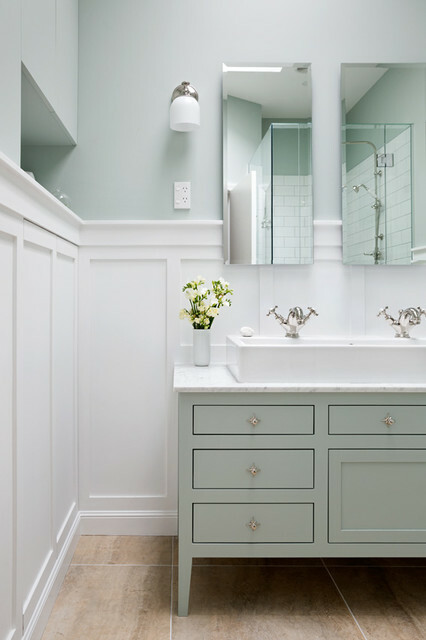 Leaning towards greys, blues and greens in your bathroom means colour won’t overwhelm the space, and these hues (particularly green) promote relaxation. If you don’t want colour on your walls, there are so many other options to bring in colour; the tapware, accessories such as towels and candles, or even artwork and plants. DL Cabinetmaking SaveEmail 4. How do I add colour to my bathroom? Don’t shy away from colour in the bathroom. If you choose it well, it won’t date and will create a stunning mood within the space. Adding colour is about creating a restful space that complements your design. Leaning towards greys, blues and greens in your bathroom means colour won’t overwhelm the space, and these hues (particularly green) promote relaxation. If you don’t want colour on your walls, there are so many other options to bring in colour; the tapware, accessories such as towels and candles, or even artwork and plants.